While today’s quarterbacks might be protected more than ever once the ball is snapped, simply getting to an NFL huddle remains a process of attrition. With only one quarterback on the field at any given time, many talented high school signal-callers — like 49ers receiver Anquan Boldin, who was named Florida’s Mr. Football as a quarterback, and Bengals wideout Mohamed Sanu, who has shown off his deep ball this season — are forced to change positions in college. And of that slim percentage who continue slinging passes in the NCAA, an even slimmer fraction will then do so for an NFL team. 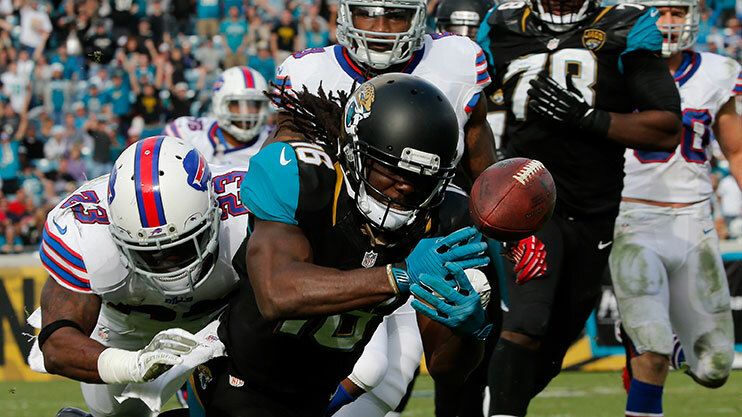 In Week 7 against Cleveland, after too many Sundays spent relying on the plodding Toby Gerhart, the Jaguars turned to Denard Robinson as their starting running back. The former University of Michigan quarterback was a shot in the arm, ripping off five runs of 10 yards or more while becoming the Jaguars’ first 100-yard rusher of the season. After reaching 90 rushing yards in each of his subsequent two games, Robinson is back in a spotlight that once had a distinctly maize hue. Once the face of an iconic college football program and the cover of NCAA Football 14, now Robinson literally stands behind a rookie quarterback from an American Athletic Conference school. It’s that willingness to change positions, though — the one conversion blasphemous to Tim Tebow — that may give Robinson a long-term opportunity in the NFL. There were high hopes that Robinson, who holds the FBS record for most rushing yards (4,495) by a quarterback, could continue that production in the NFL. Some other run-first-pass-second college quarterbacks, such as Kordell Stewart and Michael Vick, put together respectable NFL careers as signal callers. But others have been forced to carve out new roles, like Julian Edelman, a former Kent State quarterback who spends his Sundays returning punts and devouring passes as a slot receiver in New England. The most direct parallel for Robinson, though, was probably Antwaan Randle El, another Big Ten quarterback who set national records.1 Randle El, a second-round pick by the Steelers in 2002, had considerable success as a wide receiver — even though he’s most well known for throwing a touchdown pass to Hines Ward in Super Bowl XL. Changing positions is both a mental and physical challenge, though. When Nebraska quarterback Eric Crouch was selected by the Rams in the third round of the 2002 draft, the goal was to turn the reigning Heisman winner into a wide receiver, but Crouch never played a snap in the NFL. 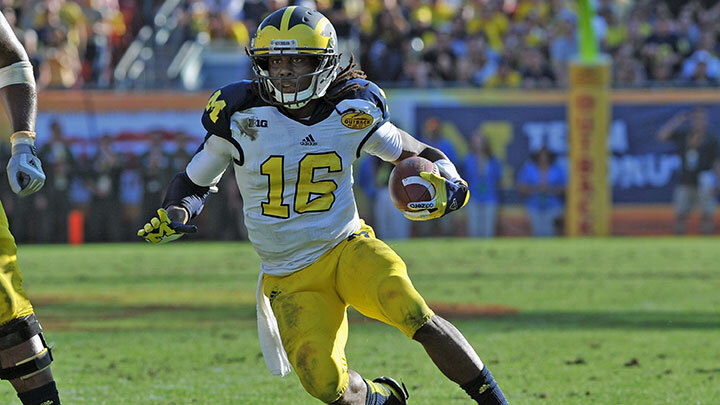 RT @EyeOnNFL: Jaguars announce they've signed Denard Robinson>>will be best player from this draft. I said it. The hype continued throughout the offseason, with reports that the “offensive weapon” — as Robinson was originally and officially designated on Jacksonville’s roster — would see 10 to 15 snaps per game. During his rookie minicamp, Robinson lined up at halfback, fullback, and wide receiver, while also returning kicks. That workload never carried over to the regular season, though, with Robinson receiving only 53 offensive snaps as a rookie. His only highlight was a lowlight: After scampering for a 24-yard run against Buffalo, Robinson fumbled the ball through the end zone. In all, Robinson fumbled three times on his 24 first-year touches. After that master-of-no-trades rookie season, Robinson focused specifically on becoming a running back. He added 15 pounds in the offseason to better absorb the weekly pounding, and without the expectations of contributing everywhere, he has become a surprisingly effective runner. It’s not hard to see Jamaal Charles or Chris Johnson — the dreadlocks sticking out the back of Robinson’s helmet help — when watching Robinson aim directly for his offensive tackles, ready to slipstream into the open field. Because as impressive as Robinson’s 4.43 speed is, it’s his willingness to wait for blocks that really has him succeeding. Like an ambulance with sirens blaring, Robinson can run red lights, but he’s found that stopping briefly at intersections helps prevent disaster, too. This season, he has zero fumbles on 102 touches. Robinson’s growth despite the inexperience around him has been impressive. All of those bad drafts have led to a young roster in Jacksonville, and in Sunday’s loss to Cincinnati, the Jaguars offense started five rookies (quarterback Blake Bortles, center Luke Bowanko, right guard Brandon Linder, wide receiver Allen Robinson, tight end Nic Jacobs) and three second-year players (left tackle Luke Joeckel, right tackle Austin Pasztor, and Robinson). In another time and another place, we’d expect Robinson to be in the middle of the huddle, ready to rally his teammates after a 1-8 start. But that’s Bortles’s job now. Anyway, Robinson has a new load to carry. Jason Bailey (@_jasonbailey_) is a Grantland copy editor. This article was updated to correct Central Florida’s conference affiliation. He was the first NCAA player to record at least 2,500 yards in four consecutive seasons. The Jaguars drafted a first-round college quarterback to play wide receiver. Three picks later, the Packers drafted a first-round college quarterback to play understudy for Brett Favre. Hello, Aaron Rodgers.